If the growing points are too far below the soil surface, it hinders or even prevents the plant from blooming. A general rule is to place the plant about two inches below the surface. I have such mixed feelings about peonies. The blooms are gorgeous—for about five days out of the year. The rest of the year, they greatly underwhelm. But so many people adore them that I hate to say that out loud! I once felt much the same way, especially when rains made the heavy blooms drop to the ground. But I started to grow more of the singles and appreciated the fact that when the flowers are gone the plant has good looking foliage. It holds its space in the border. Then there is the longevity factor. 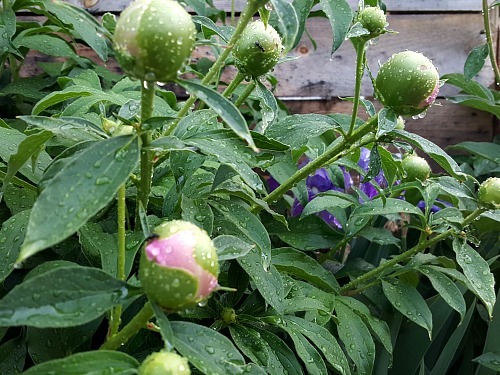 So many of my perennials are on the “graveyard list” as in they no longer grow here in my garden, but I have some peonies that preceded me.